US Secretary of Energy Steven Chu, told a packed auditorium at Tsinghua University Wednesday morning that the United States was now ready to lead in the fight against climate change. 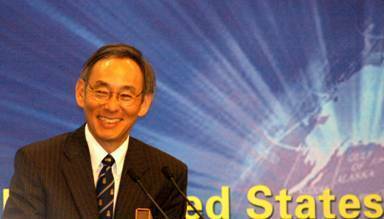 Chu, the 1997 Nobel Laureate in Physics, nevertheless was grim in his appraisal of the challenges facing the US and China. For over an hour he presented data verifying the dimensions of climate change and the ramifications for nations, particularly China, in regards to rising sea levels and stresses related to climate change. Chu revealed that until 6 years ago he too was a climate change skeptic though data accrued from deep within ice packs and concentrations of carbon convinced him that what was taking place was "very disturbing". Amid the challenges he remained optimistic that through concerted collaboration and effort particularly with his counterparts in China and other developing nations the fight could be won. According to Chu, "New ideas are the most important thing," and he went on to talk about developments in the US where computer systems were being installed to operate central air conditioning units in buildings to minimize energy waste. Elsewhere developments in synthetic biology and nano-technology were also offering promising options in terms of energy storage and capture, replicating processes found in plants. Chu was positive that change could take place to solve the energy and climate change constraints and used the issue of food production to illustrate how earlier in the 20th century there had been a fear of starvation. With government assistance and technological developments this led to the invention of artificial fertilizers and the issue was dealt with. In such a light he called upon the students present to also commit themselves to the challenges ahead. He reiterated that what was taking place now was "profound and quite startling" and that "we were all in it together". Of note he related that a lot of the carbon output here in China could be traced to the industrial sector while also mentioning that there were huge opportunities for collaboration between the US and China in terms of making buildings more energy efficient. Secretary Chu will be in China until Friday with fellow Chinese American, Secretary of Commerce, Gary Locke. Chu's ancestry can be traced to Jiangsu. Both his mother and father graduated from Tsinghua.